on a cellular level to help reduce pain & inflammation naturally. • Whiplash, Sciatica & More! Amazing therapy with a proven success rate in treating herniated & bulging discs, back & neck pain, sciatica and more without surgery or medication! Utilizing painless infrared light, this treatment can help reduce pain and inflammation in the muscles and joints naturally and promotes healing. At our facility, we will provide you with all the tools you need to lead a healthy, pain-free life such as chiropractic, weight loss and more. This treatment elongates the spine to reduce pain from herniated, bulging discs or those experiencing pressure in the spine from daily activities. Chiropractor in San Antonio TX: Comprehensive Chiropractic & Physical Therapy is a premier chiropractic facility and wellness center. Dr. Charles Oliver specializes in various chiropractic techniques along with wellness services to help you maintain your health. From children, to athletes, to those who are pregnant, we can help you feel your best naturally! Along with being a unique and experienced chiropractic center, our friendly staff will work with you to get you an appointment that fits with your schedule. We accept most insurance plans. Stop by our office today or call to schedule an appointment to see why Comprehensive Chiropractic & Physical Therapy is the best place to receive chiropractic care for your ailments! Recover quickly from injury with customized rehabilitation programs that involve stretching and exercises to reduce pain. A healthy spine promotes optimal growth and development so a child can be all that they are meant to be! Your child is in good hands with our caring staff. Get back in the game quickly with chiropractic care, physical therapy, cold laser, electric muscle stim and more. Getting prenatal chiropractic adjustments can help alleviate lower back pain, nausea and other ailments commonly associated with being pregnant. Alleviate back pain from injury and more through chiropractic care, which helps to align the body for optimum function by reducing subluxations. Chiropractic adjustments and physical therapy can alleviate whiplash symptoms and prevent further injury. Electrical muscle stimulation is the utilization of muscle contractions using electric impulses to manage chronic and acute pain. Utilizing various non-invasive techniques, this muscle-release treatment helps with releasing the trigger points in the body to decrease pain. Why Choose Comprehensive Chiropractic & Physical Therapy? 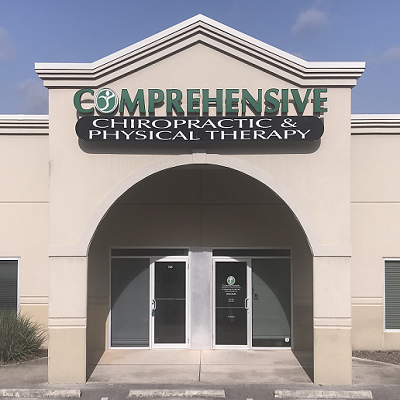 Chiropractor in San Antonio TX: At this chiropractic and wellness center, patients are treated to a state-of-the-art facility that is furnished with the latest technologies and equipment. You will be provided with the results you deserve with a comprehensive analysis and treatment plan. Chiropractic adjustments are a safe and effective way to accelerate, maximize and maintain your journey to good health and ongoing wellness. Countless services are available to treat most conditions, including physical therapy, cold laser therapy, spinal decompression and more. Dr. Charles Oliver is committed to providing you the best care in San Antonio and surrounding areas! Our friendly staff and expertise will put you at ease every time you walk into the center. Call today to feel better naturally now. Call (210) 545-1810 or click to schedule your appointment.